By Chanda Neely, Northeast Ohio Media Group on March 31, 2014 at 1:03 PM, updated April 01, 2014 at 11:39 AM BEACHWOOD, Ohio –- Local television personality and exterior living expert AJ Petitti of Petitti Garden Centers talked about this year's newest outdoor living trends during a workshop Friday at the Ohio Design Centre. 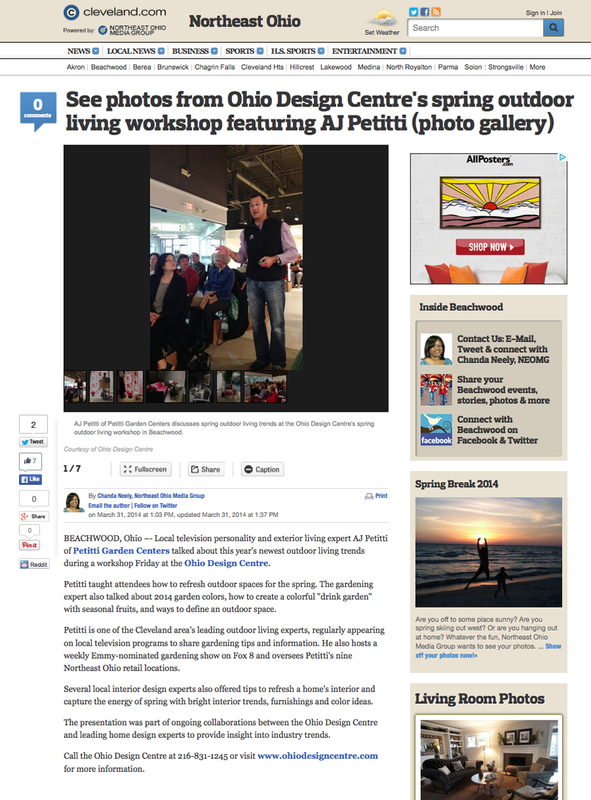 Petitti taught attendees how to refresh outdoor spaces for the spring. The gardening expert also talked about 2014 garden colors, how to create a colorful "drink garden" with seasonal fruits, and ways to define an outdoor space. Petitti is one of the Cleveland area's leading outdoor living experts, regularly appearing on local television programs to share gardening tips and information. He also hosts a weekly Emmy-nominated gardening show on Fox 8 and oversees Petitti's nine Northeast Ohio retail locations. Several local interior design experts also offered tips to refresh a home's interior and capture the energy of spring with bright interior trends, furnishings and color ideas. The presentation was part of ongoing collaborations between the Ohio Design Centre and leading home design experts to provide insight into industry trends.